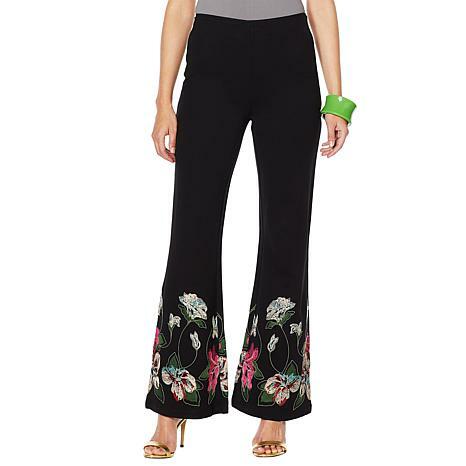 Add a stellar and star-power pant to your wardrobe rotation. 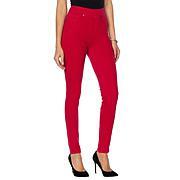 This one features a tailored like silhouette so you know you look as stylish as you feel. 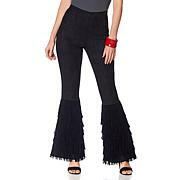 I ordered the size medium and the size is consistent with previous pants in this style offered on HSN by Iris. These are very "belled" and long, but I like them all the same. This is my third iteration of this style pant - the other two are printed fabric. On the fence about whether I really need a third pair. I'm size 14, got medium and fits well. Long. I long the fabric, luxury and well made. The embroidery is exquisite. I got the matching top and can't wait to wear the outfit. Very flattering standout! Had to return these, as they were way too long for me, even with heels, and I"m really not that short. But I loved them. Hemming would have ruined the leg edge.